The Java IEEEremainder Function is one of the Java Math Library function and it is used to find the remainder of the two arguments as prescribed by the IEEE 754 standard. 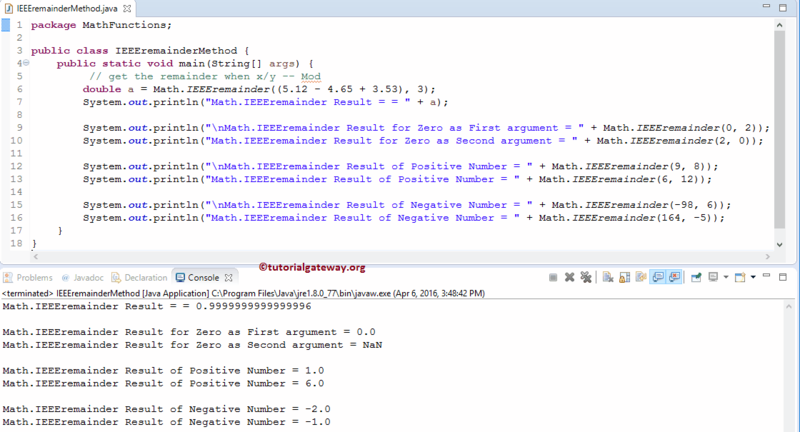 In this article we will show you, How to write Math.IEEEremainder function in Java Programming language with example. x: Please specify the dividend value here. y: Please specify the divisor value or power here. The Java Math.IEEEremainder function will find the remainder of the two arguments. The remainder value is mathematically equal to x – y × n, where n is the integer closest to the exact mathematical value of the quotient x / y, and if two integers are equally close to x / y, then n is the integer that is even. If the first argument is infinite, Math.IEEEremainder will return the result as NaN. If the second argument is positive or negative zero, Java IEEEremainder will return the result as NaN. When either the x or y argument is not a Number, Java Math.IEEEremainder will return the result as NaN. If the first argument is finite and second argument is infinity, then Math.IEEEremainder will return the first argument value as result. The Java Math.IEEEremainder function is used to return the remainder of the given number. Within this Java IEEEremainder function example, First, We declared variable a of type Double. Next, we used the Java Math.IEEEremainder function directly on expression. Here, we used System.out.println statement to print the result as output. Next, We used the Math.IEEEremainder Function with one positive double value and other argument as zero. Here, We used the Java IEEEremainder Function directly on Positive double values. Next, We used the Math.IEEEremainder Function directly on Negative double values.